Matcha – what a phenomenon! 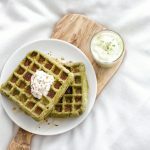 I myself have to admit, that 5 years ago I had no clue about what Matcha Green Tea Waffles is or that it will become such a big hype in the food and health industry – yet I am here, and I am totally hooked! I love sneaking some Matcha powder into my food and drinks – for an extra kick of energy. Cause let’s be honest: every full-time working human needs such a kick every now and then. 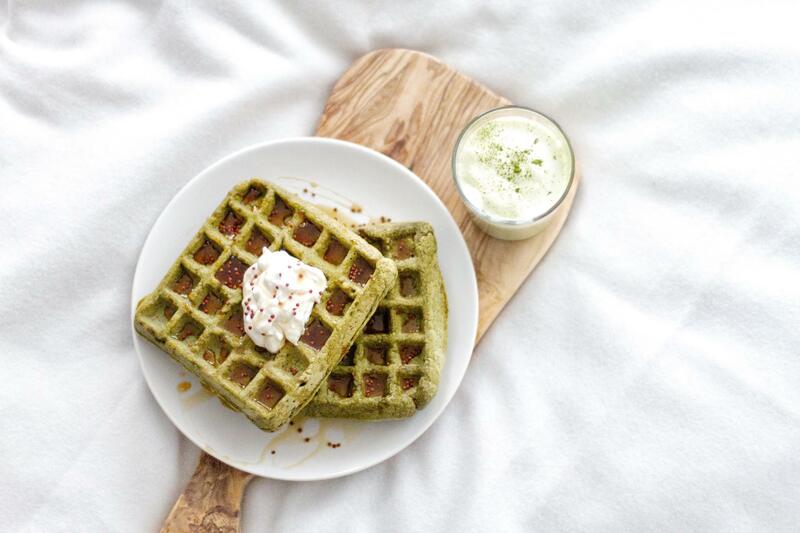 Matcha Green Tea Waffles is a finely ground, bright emerald-green tea powder prepared from a high-quality shade-grown leaf known as tencha. The Buddhist monks honored matcha tea as the ‘health elixir’ for its potential to heighten the concentration and enhance the metabolism. Matcha is a time-honored beverage which is source of vitamin A, vitamin B-complex, vitamin C, Vitamin E, vitamin K and trace minerals. It is also rich in antioxidants including polyphenols, catechins and chlorophyll. Matcha is said to have plenty of health benefits, such an immunity boost, detoxification and cardiovascular health. 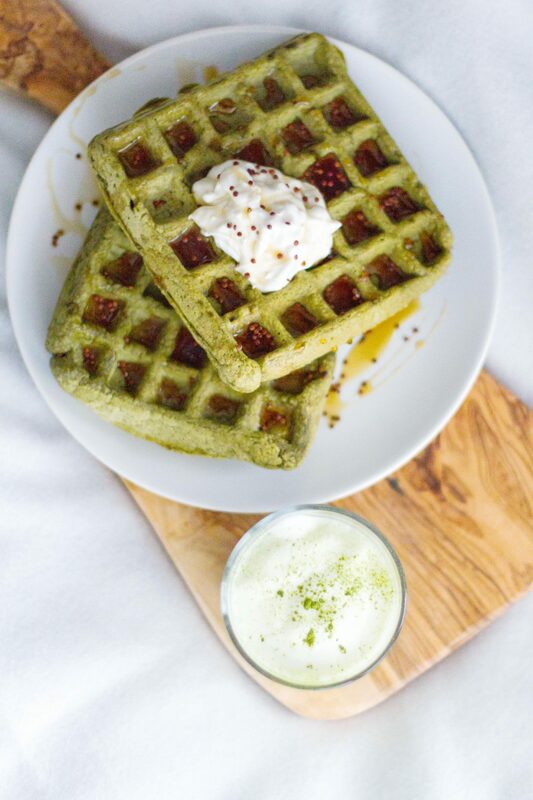 If you are trying to reduce unhealthy amounts of coffee, but need a pick-me-up Matcha Green Tea Waffles is just perfect for you, especially if you are not a fan of drinking Green Tea, cause Matcha has its own distinct flavour and does taste way better than a cup of green tea. Another pro-point is also that you only need a tiny amount of powder for maximum effect. A little can go a long way here – It’s just perfect! I have been wanting to make some Matcha Green Tea waffles for ages now. All of those fancy photos on Pinterest made me definitely hungry for it, so it was about time! These ones are made completely without gluten as well, as I used gluten-free oats as a base for the self-ground flour. If you do not own a spice grinder or a high-quality blender, you can of course also store-bought oat flour. 1. Add the apple cider vinegar to the soy milk in a tall container and place it in the fridge for 5-10 minutes while you are completing step 2. 2. Grind the oats in either a spice grinder or a high-speed blender until the consistency resembles flour. I have used my James Martin spice grinder for this (it’s great – not only for spices!) but if you have neither at hand, you can also use store bought oat flour. 3. Add the salt, baking powder and vanilla protein powder to the oat flour and mix well using a large spoon. 4. Remove the soy milk/vinegar mixture from the fridge and give it a stir. You will realise that the soy milk has curdled up, which gives it a resemblance to butter milk. 5. Create a little well in the flour mix and slowly add the liquid. Blend everything with a whisk until it is smooth. If the mixture appears to be a bit too dry, add some more soy milk in, or alternatively water. 6. Preheat your waffle iron and once it is hot, grease it with a little coconut oil and add some of the mixture. How much you need to add is pretty much down to the waffle sizes on your waffle maker. Mine makes really big waffles, so I need to add a lot of mixture and get less waffles in total. This is all about trial and error here, so test it out with the first waffle. Pro Tip: Using a waffle maker it is important not to attempt opening it to early – the waffle could fall apart and cause a mess. So simply add the mix, close the waffle maker and leave it for about 5 minutes at least before you gently check. Don’t be alarmed if you see steam coming from it – this is absolutely normal as the liquid vaporises. Do you have any other recipes using Matcha? I’d love to see/hear about them, so make sure to tell or link me below in the comments section!